Who can use this Consultant Appointment? Any company or organisation that wants to engage an independent consultant or freelance individual to provide services. 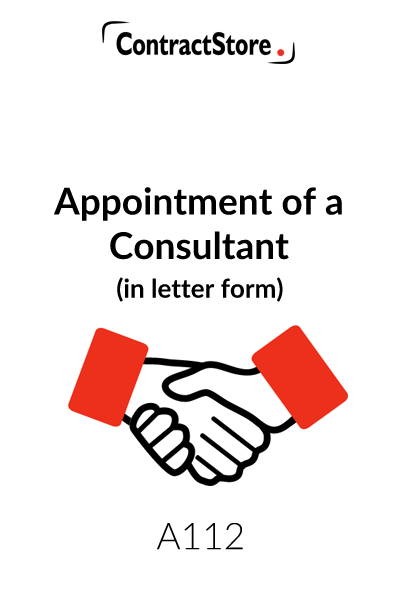 What is a Consultant Appointment Letter for? 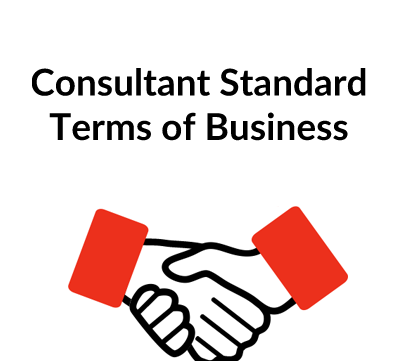 It sets out the terms on which the consultant will provide services over an agreed period in return for a fee. The fee is either fixed or calculated by reference to hourly/daily rates. It can be used for a wide range of different service providers. What are the main points covered by the Consultant Appointment? 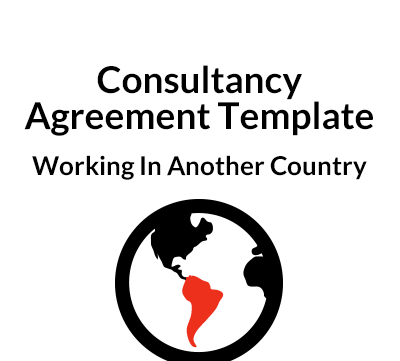 The 15 paragraphs in this letter can be adapted for a great variety of consultancy appointments – particularly useful for short-term appointments where a consultant is engaged for a few months on a particular project. 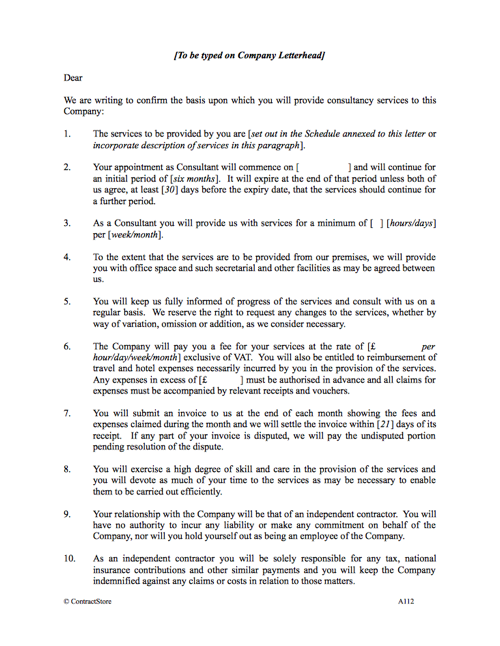 An agreement can be in the form of a letter which in this case is addressed to the consultant by the company appointing them. When the letter is accepted and signed by the consultant, it is an effective binding agreement just as a more formal agreement between Party A and Party B would be. Yes. You can buy it once and use it for any appointment you sign up with a consultant in your business. All ContractStore’s templates are in MS Word. As well as filling in the details – scope of work, fees, etc., – you can print it on your business letterhead as well as alter or add to it if you need some special terms. Consultants come in all shapes and sizes and a vast range of specialisms. This form of appointment is designed for a client appointing an individual consultant to provide services over a fixed period. The precise nature of the services is to be set out in the letter or in a schedule which would be annexed to the appointment. The appointment is in letter form issued by the Company in duplicate to the Consultant. The letter, once it has been countersigned by the Consultant, will constitute a contract between the two parties. Any amendments should be put in writing and signed by both parties. The letter deals in paragraph 2 with the period during which the services will be provided, and paragraph 3 refers to the minimum time commitments which the Consultant may have but this wording may need to be adjusted if it is not suitable – e.g. where the Consultant is undertaking a particular task which does not involve a specified number of hours per day or days per month. Paragraph 4 deals with accommodation and Paragraph 5 requires regular reports and entitles the client to vary any of the services. Paragraph 6 specifies the fee arrangements and also deals with expenses while paragraph 7 deals with payment. Paragraph 8 sets out a benchmark for the standard of skill and care to be applied. Paragraphs 9 and 10 make it clear that the Consultant, even if he/she works as part of the Client’s team, is, technically at least, an independent contractor and is not on the payroll of the Company. Advice on the tax implications is strongly recommended here: HM Customs and Revenue in the UK, for example, may require a company to treat an individual as an employee rather than an independent consultant in certain circumstances, one effect of which would be to require the company to deduct tax from the payments due to the Consultant on a PAYE (Pay as You Earn) basis. Confidentiality can be important to a Company where a Consultant has access to trade secrets – hence paragraphs 11 and 12. Where the Consultant has dealings with customers or suppliers of the Company, it may be sensible to impose not only a confidentiality obligation but also a restriction from seeking business from those people after the appointment comes to an end. Paragraph 13 contains wording to deal with this. One warning here: restrictions of this type have to be reasonable and may not be upheld by a court if they have the effect of depriving the individual consultant from earning a living or if they unnecessarily onerous. Legal advice should be obtained. Intellectual property rights may be created by the Consultant, but with a consultancy such as this one the Company is likely to require ownership of those rights just as it would with an employee, and this is covered by paragraph 14. Sometimes a Consultant will expect to retain ownership, in which case, if this is agreed, the paragraph should provide for the Company to have an irrevocable licence to use the intellectual property rights created by the Consultant in the course of his/her services. Paragraph 15 specifies that the services are personal. 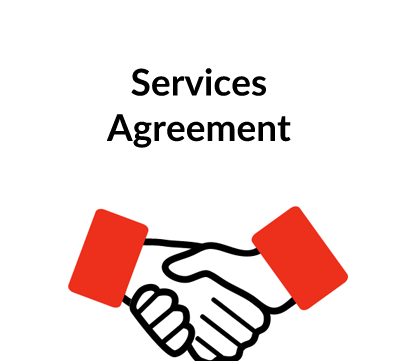 Paragraphs 16 and 17 respectively provide for the Company to terminate the Agreement early on 30 days notice, or immediately if the services are not being performed satisfactorily. Finally, this letter of appointment assumes that the consultant is performing services in the same country as the Company. Should there be an international element, for example if the client is an English company and the consultant is based in France, a “governing law and jurisdiction” clause should be added which can be downloaded free of charge from our website (see document Z139).